Yukari Kaihori creates paintings to examine the intersections between physical and internal landscapes, with a special focus on how those landscapes interact with memory and imagination. She often starts her work by running watery oil paint on the paper surface, staining the paper and making a figure by chance. Observing this figure and then introducing controlled marks, she creates forms that are open to one’s own personal interpretation. Organic shapes and patterns appear in her works, often resembling landscapes, which may subconsciously spring from a deep attraction and admiration towards nature. Kaihori suggests this appreciation may have arisen from the fact that she grew up in a several vastly different countries where culture, people and values varied so widely that the natural world was one of her life’s only constants. As a result, her works tend to incorporate organic shapes and a language of landscape with hybrid of figures and abstraction. 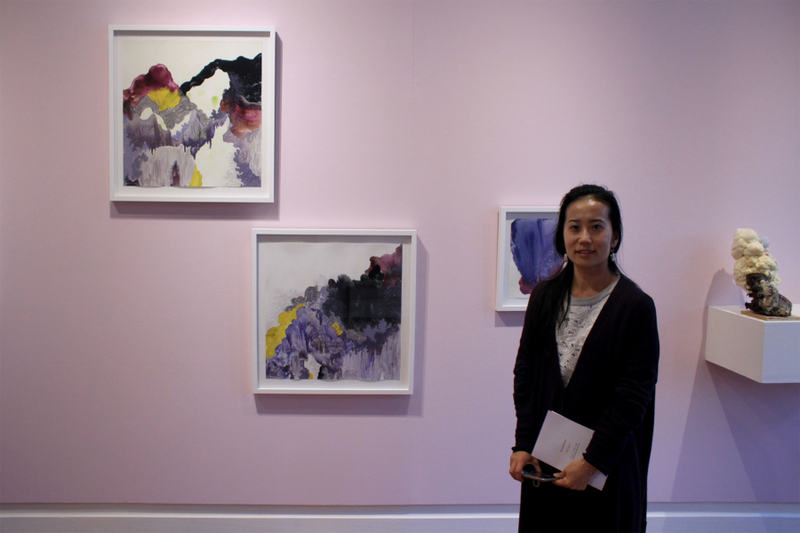 When asked about her current exhibition Sweet Dreams at Corban Estate Arts Centre, which includes a series of abstracted mixed media paintings and mineral sculptures, filled with deep violets, lilacs juxtaposed with mustard yellows and forest greens, Kaihori replied with a thoughtful response about being inspired by her grandmother’s personal tanka and haiku. “The show Sweet Dreams was inspired by my late grandmother’s book of written tanka and haiku (Japanese short poems that were used as a personal letter or communicative message in the old days). My grandmother passed away in 2016. I went back to Japan to sort out all the personal belongings in their house with my mother. We found her diaries and a book of poems. She didn’t mean for anyone read them. They are all very personal. I know my nana – she was selfless and always cared about the family. But the poems were written by this woman I kind of did not know, didn’t recognise. I learned she was adopted at age 3 as her mum died and as a result she had a very hard upbringing. She survived the war but could not be with her then boyfriend because of her duty to family and the consequences of the war. Later, she had an arranged marriage with my grandfather and became a housewife. Nana never told us much about the past. No-one from the World War II generation talked much about the past because it was a difficult and dark time. Reading these poems that she wrote throughout her life made me see her as a woman who experienced joy, sadness, death, loss, separation, marriage, family, kids, grandchildren all the while observing everyone growing up. While this woman longed for what she lost, she appreciated the simple joy of life. She carried all these experiences with her. The poems are timeless. While reading them, I could imagine my nana writing these words as a young woman. Nana’s writings are very private so I didn’t want to publish them. But as an artist, I was inspired by the writings to produce something, especially as I have so much respect for my grandmother’s generation of women. These women survived a great war and I can empathise with them, it was not easy being a woman around this period of time. I am grateful for all women who came before our generation and for all their unseen emotional and physical labour. They are often nameless but thy deserve recognition. As an artist, I wanted to turn personal inspiration into something public. In a way, Sweet Dreams is my own personal eulogy for all the women who came before us and acknowledgement of what they endured and still endure. I wanted to put the focus on how the timeless aspect of nana’s writings are relatable for everyone, that life is full of joy but also as a human, one can also long for something lost – we carry the good with the bad and it’s okay. Beauty and sadness co-exist in reality. But one can pass the beautiful part onto next generation in the form of hopes and dreams. There is no simple “happy ending” in life. 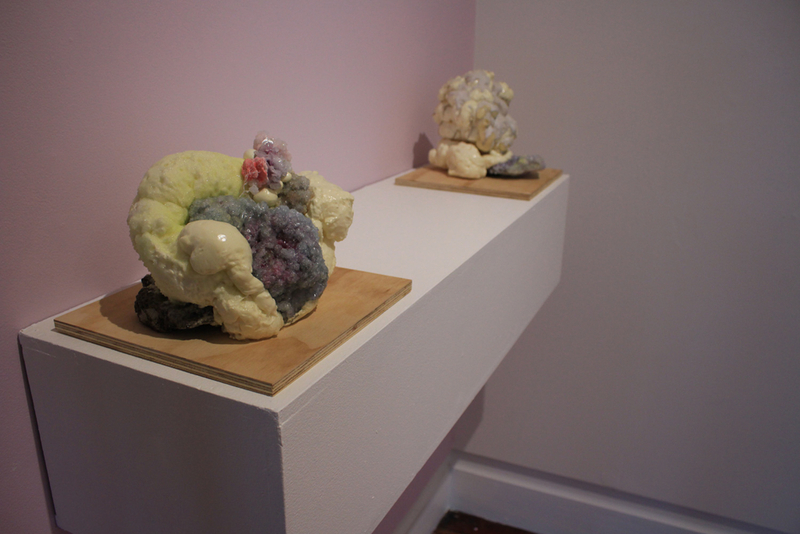 Around the same time, I was experimenting, making sculptures with mineral crystals. I believed the visual aspects of the crystal sculpture and specific styles of paintings could convey the inspiration I got from my grandmother’s poems so I proposed this exhibition. Cora-Allan Wickliffe (Corban Estate Arts Centre Curator) liked my idea and offered me a show in mid-2017. I also had an opportunity to participate in an artist residency in Germany in the summer of 2017 so I had six weeks to create painting works inspired by my grandmother’s writings and fully immerse myself in this process. 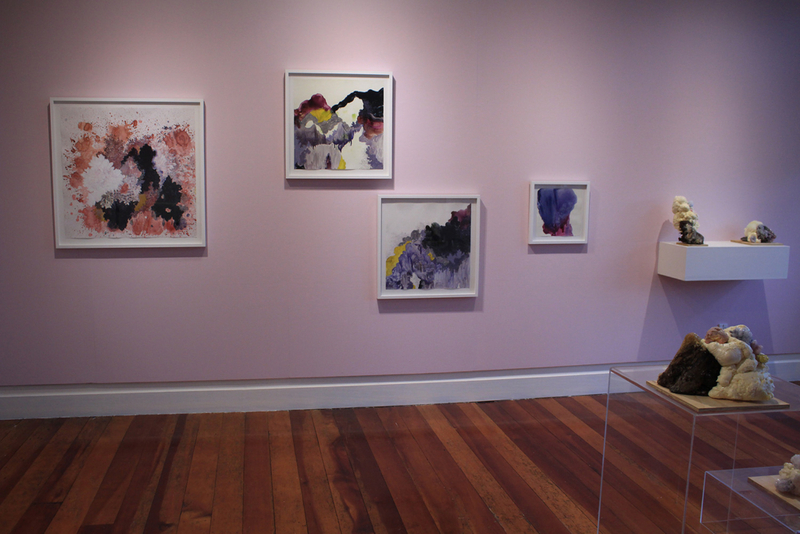 Yukari Kaihori, (b. Osaka 1980), a Japanese artist, based in Wellington New Zealand since 2011, has exhibited her work both locally and internationally. In 2015, she was awarded the highly coveted Pollock-Krasner Grant. She grew up shifting from Asia to South America to North America. Yukari earned her B.A. in Studio Art in 2004 from Lewis and Clark College in Oregon and she was recently a Fellow at the Vermont Studio Center and Virginia Center for the Creative Arts and Oberpfälzer Künstlerhaus in Shwandof, Germany.